I accidentally broke my nieces bubble aeroplane so bought this bubble machine and hate it. Its so noisy but also all the bubbles clump together if moved around which is a pain so I'm going to keep an eye out for another bubble blower. 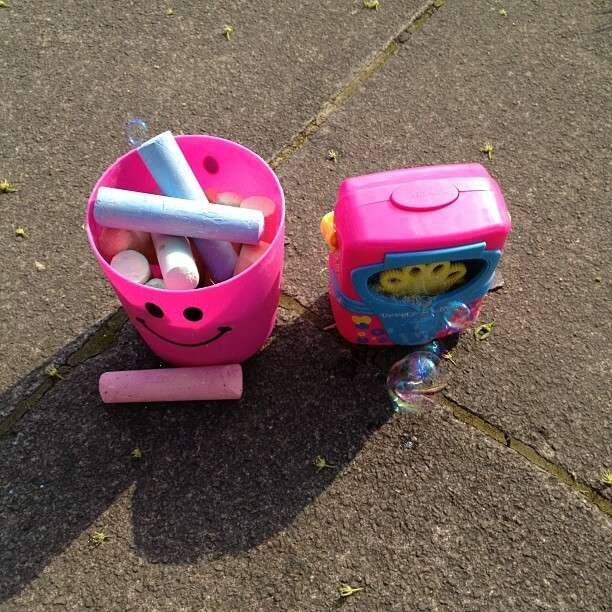 We enjoyed the sun by having bubbles surrounding us and drawing with chalk on the pavement, it so much fun! 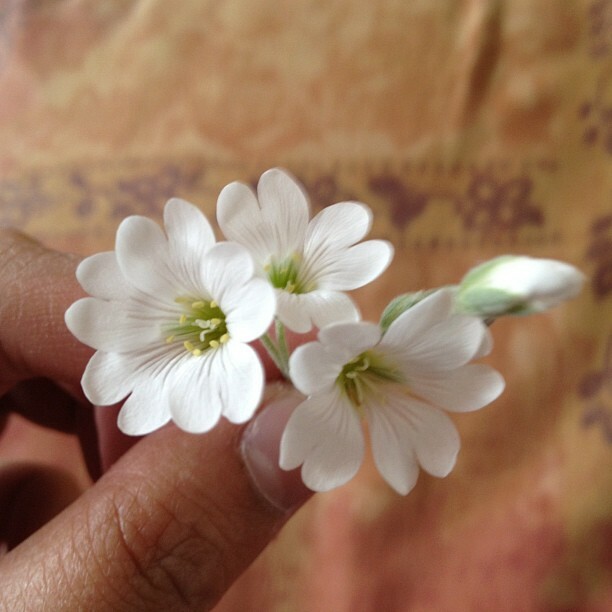 I forgot to share these flowers she bought me the other day, it was so sweet but I really need to remember to put them in my flower press. Its the downside to working all day and coming home to just wanting to rest. She accidently burnt her foot on an iron today, luckily not badly but I feel such an idiot for not paying more attention. She was sat on my desk chair which I moved so that I could iron my clothes, she was cross about it so sulked off and went on to my bed wanting to look out of the window which I had to tell her off about as she could easily fall out. I put everything back except the chair and started getting changed, she pulled the chair into the right place and sat down so skimmed her foot on the iron which was under my desk. It hurt her but she made out it hadn't and I couldn't see it until I put some Savlon on and it started swelling. I hope that it will be ok. I bought a new outfit today as on Friday we will be celebrating the Queens Jubilee. I tried finding a red and white outfit as I have some blue jewellery but I couldn't find anything in all the shops I went to. It's one of the reasons I didn't blog yesterday, I was just so tired, I'd actually gone out with my husband as he wanted some new sandals but didn't like anything so I got a little cross with him, saying he wasn't going on a catwalk and just to buy a pair. The problem is all the shops more of less sell the same thing so obviously all the other men out there are wearing them too. Anyway in the end I went to Bradford Bazaar and bought this one. My mum was with me at the time and I asked her opinion and didn't get it... now I've bought it she's complaining I paid too much! With Pakistani/Indian sellers you have to haggle even in this country, I hate it. 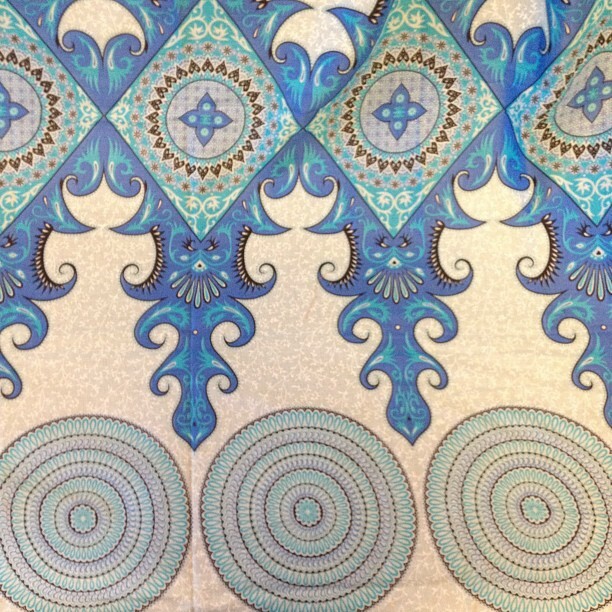 The picture is of the scarf, the rest is fairly plain but I really like it.... its a few shades of blue and white, not pink as the photo seems to come across as. The weather is amazing but they say by Thursday its going to rain... I hope not as we are going to my favourite park for a David Hockney event. Still I want this week over and done with as we have holidays next week and I can't wait. I don't know yet how I'll spend it as it all depends on the weather. I'm just glad she just skimmed it and its the tinniest of marks that won't scar, its awful to think that it could have been much worse. It was just annoying day to shop but I just hope that my mum can sew it in time. It will apparently be like that for us on Thursday but I hope not as I'm tired of the rain and darkness now. Enjoy it Bubbles, and a little bit for me too, would you? !